Can Hair Products Actually Cause Shedding? It can be scary, thinking of how delicate our hair really could be and how susceptible it might be to products, styling, and other forms of manipulation. Sometimes I am even afraid to eat certain foods because of my new found “hair-fall” phobia! For this reason, many are unsure of what products to use for fear that the products could make their hair fall out. But, can hair products be a cause of hair-fall? It is good to seek the truth when it comes to myths that affect important parts of your life like your hair! Join me in exploring what really causes hair to fall out. 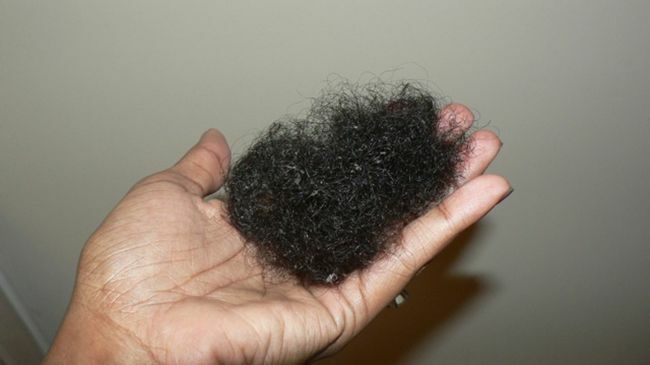 Human hair grows and falls within a cycle of four phases. Beginning with the anagen or growth phase which can last anywhere from 2-6 years. During this time the hair follicle, nourished by the blood supply beneath the scalp, produces hair that grows roughly 1 centimeter every 28 days or 6 inches per year. The next phase is the catagen phase, which last roughly 2-3 weeks. During this time the hair growth ceases and the follicle shrinks and attaches to the root of the hair, forming what’s called a “club hair.” Next, the telogen phase, or resting phase, can last up to 100 days. In this time the “club hair” is completely formed and prepared to shed. Within two weeks a new hair follicle will emerge. Each hair cycles through this process on its own time rather than a collective syncopation. This is why you do not notice much of its happenings. This process is completely normal and healthy. Most people lose anywhere from 50-100 hairs a day. What role do products play? Products can condition, style, and protect your hair from damage once it has been successfully produced from the hair follicle. It conditions the hair through leaving behind strengthening and hydrating elements onto and in some cases beneath the hair shaft. However, hair products do not nourish pre-existing hair. New hair is nourished through the blood that feeds the hair follicle. The right product combination should keep your existing hair strong and moisturized while enhancing its appearance with its various styling properties. “Products like shampoo will not bring out your hair unless your hair is already falling, in which case it would have fallen anyway. In other words, if you are already experiencing hair loss, then you will notice the shedding through the cleansing process. But shampoo is designed for one thing; to cleanse. So the answer to the question is no, products cannot make your hair fall out. However, it is good to know that brand new hairs known as vellus hairs are known to be sensitive to sulfates, therefore I advise thinning-haired clients to use sulfate-free products to protect the new hair growth. Hair loss and thinning is caused from something within, sometimes from stress, menopause, thyroid, or other hormonal influence, but, unfortunately it is easy to blame the hair loss on the last topical experience. You see, hair fall occurs at the root where we cannot see, so we know that external aids cannot be the cause, but can only “pre-rush” what is already in motion to occur. The hair shaft however, can be damaged through excessive braid styling, chemical treatments, and heat styling.”- Rodney Barnett, trichologist of the Hair Restoration Center in Dallas. This is great news! According to our expert trichologist, hair products alone cannot cause shedding, but rather what is happening on the inside. So, regardless of if your curl pattern is curly, wavy, or coily, keeping yourself in a healthy emotional balance is beneficial along with a healthy diet and active lifestyle to fortify the blood supply that nourishes the hair follicle. Remember that appropriate hair care is equally important for preventing damage to the hair shaft. Those with thinning hair should opt for a sulfate-free shampoo to protect all hairs, but especially the new vellus hairs as they develop. So fear not, there is no need to fret over non-existent side effects of that new product you have been eyeing. Just go for it. Doesn’t it feel good to be set free by hair-truth? So, what products do you currently use? For additional information please visit www.rodneybarnett.com or email him at [email protected] Other resources: www.hairdoc.com, www.rodneybarnett.com.